I love maps. I especially love online maps. They let me zoom, pan, and change the features being displayed. Google Maps was truly wonderful after using Mapquest, etc., for so many years. 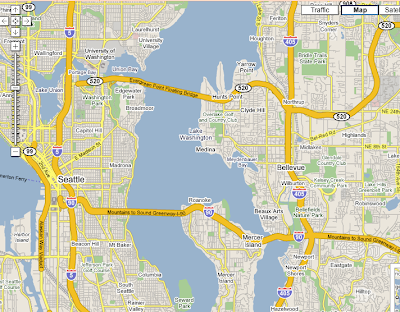 Microsoft and Yahoo also have draggable maps now. Roads. I want to know how to get there. Only Google shows the roads clearly. Yahoo shows dark gray on medium green, which is barely visible. Microsoft shows dark gray on medium gray, which is even worse, and nearly impossible to find unless you already know where to look. 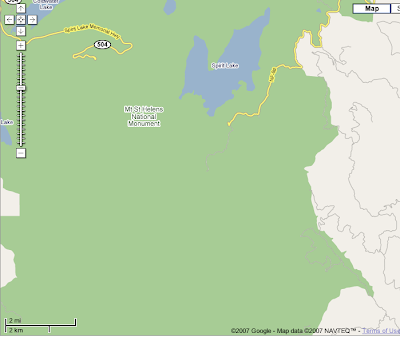 Just try to find the western end of NF-99 on Microsoft's maps. None of the services offered as much information as the park maps. Stops. I want to know where I can stop, take pictures, go on a hike, etc. None of the three mapping sites I tried have this information; I instead got some of it from the park map. Another way to get this data would be from geotagged images; if I could see the most popular spots for photos, I'd know where I should go. The other thing you might notice from these three maps is that Microsoft's typography is excellent. Google has a nice font but surrounds the text with bright yellow or white to increase contrast, which is quite distracting. Yahoo's text is decent and has less distracting contrast. But Microsoft's text is really nice. Instead of a white border they use a subtle white shading to increase contrast. It's very clean. 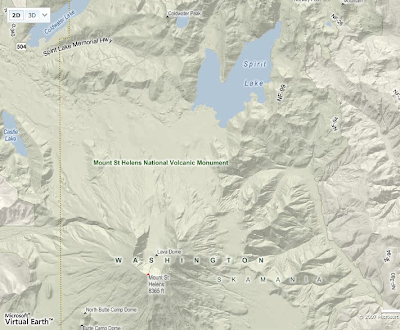 They also use different fonts for different types of features — compare “WASHINGTON”, “Mount St Helens National Volcanic Monument”, “Spirit Lake”, and “Mount St Helens 8365 ft”. It looks more like a “traditional” map than Google or Yahoo. In the end I used the park map for roads and features, Google maps for driving times and directions, Microsoft maps for getting a general sense of where the scenic areas are, and my Rand McNally U.S. Atlas (paper, not online) to find out which routes were marked “scenic”. In urban areas Microsoft continues to have good typography with labels that are easier to read than Google's or Yahoo's. They also seem to be placing the labels more intelligently to avoid drawing over important areas. 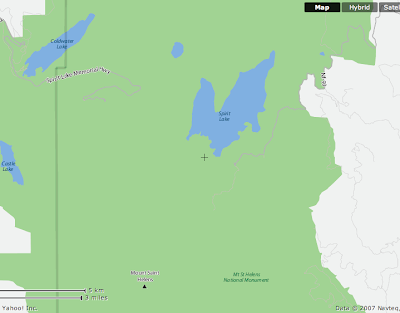 Microsoft also has labels for more items on the map. The terrain doesn't play a role here, although the east side of Mercer island has terrain that explains why the roads curve so much. Google's roads are easiest to see. 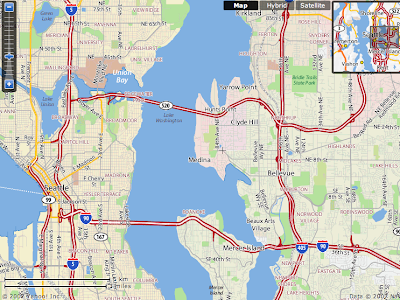 Yahoo shows each city in its own color, which can be useful at times, and it also makes highway entrances easy to see. 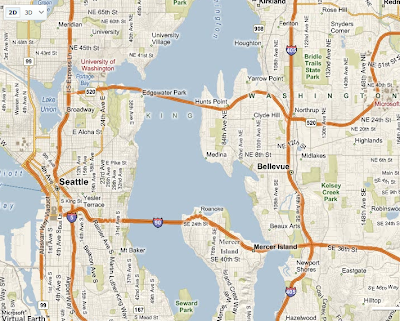 Microsoft shows more roads (faintly), which gives me a better sense of which areas are sparse/industrial and which areas are dense/residential. Which site do I use most often? In general I get more information out of Microsoft's maps than Google's or Yahoo's, but Microsoft has a few annoying implementation details that keep me from using their maps more: (a) their awful browser detection script rejects me unless I lie about my user agent, and (b) I get a stupid dialog box asking me to install a Windows 3d plugin … even though I'm not wanting 3d, nor am I using Windows. There are things about each of the three that I like, but in the end I'm still using Google's maps most often. It's fast and the roads are easy to see, especially in cities.